When New Brunswick was established in 1784 it was divided into eight counties. As the population grew additional counties were created by dividing the original counties, the final complement being 15. These counties are subdivided into civil parishes. Parishes have minimal administrative weight today but were used in the past to manage services, thus making them important in identifying some records. 1786: Sackville, Moncton, Hopewell and Hillsborough were established. 1787: Dorchester and Salisbury were established. 1805: Botsford was set off from Sackville. 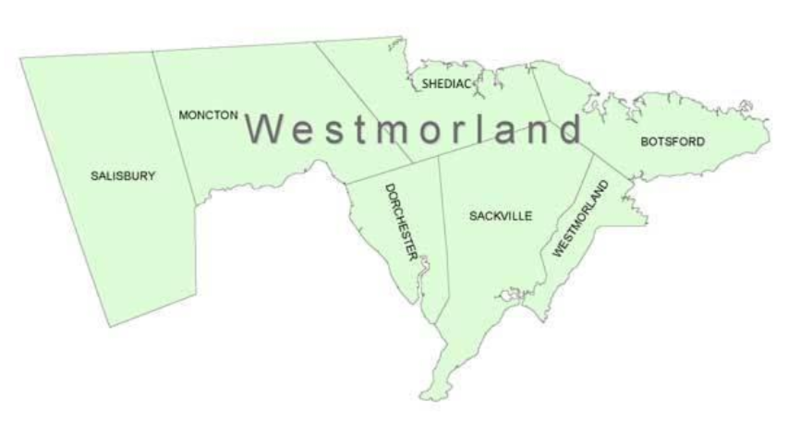 1827: Shediac was set off from parts of Sackville, Dorchester and Westmorland. 1828: Coverdale was set off from Hillsborough. 1835: The boundaries of Moncton parish were expanded to include part of Dorchester. 1838: Harvey was set off from Hopewell. 1845: Albert County was created from the Westmorland County parishes of Hopewell, Hillsborough and Salisbury. 1896: There was some realignment of the parish boundaries. For a copy of the guide, please click here to download.